I would like to give a special thanks to Shane Carter aka Carter K9. Shane you taught my dogs and me more than I could have ever imagined! Without your support, help and training we would have never accomplished even half of what we did. You made me look to the sky with my goals and never give up, to be patient and never look back. I give you more than just credit, you made Shock-N-Aw Bullies what we are today. You set the bar high not just for me but for other to follow as well. A great big Thank You to Jim aka Walton Creative Studios, for creating an amazing logo for Shock-N-Aw Bullies! You really went outside the box with your graphic works and creativeness. Jim you have been there with us from the beginning, trained with us and watched each other’s dogs grow better in their training and the owner’s knowledge. Again Thank you. bring better training and awareness to the breed that is so misunderstood. 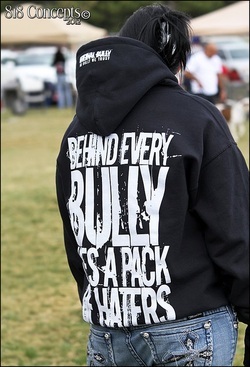 Original Bully you guys are always gave us support and love, you know the quality of our dogs and give your dogs that! your designs always speak to us with class and power and as always tested by your amazing dog to make sure its bully proof. Samurai Styles provided a GREAT T-Shirt design for Shock-N-Aw Bullies. They continue to be a great supporter for the breed and still do amazing designs. Samurai Styles is a great ambassador for the breed with their Bully Bunch group, they are an inspiration to all with these dogs. Thank you! Another special thanks you to Bill and Neva of Blue Fury Kennels. You have always been there for the dogs and me! You are great supporters of the breed, their owners and have become true friends. Thank you for hanging in there through thick and thin and always having great insight on the bully community and its goings-on.